Concerned by loud snoring and sleep apnea symptoms in Anchorage? If you are seeing Dr. David Green for a routine exam, do not be surprised if he asks you questions about your sleep. This may be a part of a screening for sleep apnea, a potentially life-threatening disorder that many dentists are able to detect before general physicians. Perhaps you mentioned something earlier in your exam that caught Dr. Green’s attention, or perhaps he has noticed something during your exam that suggests a problem. When left untreated, sleep apnea can affect quality of life and health significantly. Conscientious dentists like Dr. Green are very attuned to the signs of the disorder because they know early detection could save a life. The most common type of sleep apnea is obstructive sleep apnea, in which a person stops breathing as they sleep and then wakes up gasping for air (without realizing it). This occurs when the tissues at the back of the throat collapse during sleep, blocking the airway and obstructing the flow of oxygen (and causing snoring or sputtering noises). These cessations in breath can happen hundreds of times per night in the most advanced cases. Because individuals with sleep apnea are constantly waking up, they don’t get the quality restful sleep their bodies need. A chronically exhausted person is vulnerable to automobile or workplace accidents; they are also more likely to be obese. Studies now show that sleep apnea can raise the risk of stroke, cancer, diabetes and heart disease. Dentists are at the forefront of sleep apnea detection because some of the signs appear in the mouth first. For example, one of the first signs of sleep apnea is tooth grinding. Chronic grinding wears down the surfaces of the teeth, which a dentist can easily notice during a routine exam. Or, some patients complain about waking up every morning with a dry mouth, which can signal to the dentist they may have a sleep disorder. If you experience any of these symptoms, you should schedule an appointment with your primary care physician or Dr. Green. He can refer you to a sleep medicine specialist to have a sleep study. Although Dr. Green is very knowledgeable about the symptoms and treatment of sleep apnea, he cannot formally diagnose the condition. If a sleep specialist confirms that you suffer from sleep apnea, Dr. Green can help. He can fit you for a special oral appliance to prevent further sleep apnea episodes. Oral appliances are designed to keep the airway open and breathing unobstructed by repositioning the jaw and tongue. Oral appliances are highly preferred to traditional CPAP machines because they are smaller, lighter and more portable. Dr. Green can also provide you with more information about making the appropriate lifestyle changes. 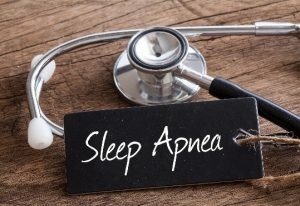 For more information about the detection or treatment of sleep apnea, don’t hesitate to contact Turnagain Dental and request an appointment with Dr. Green. Call or email our office today.